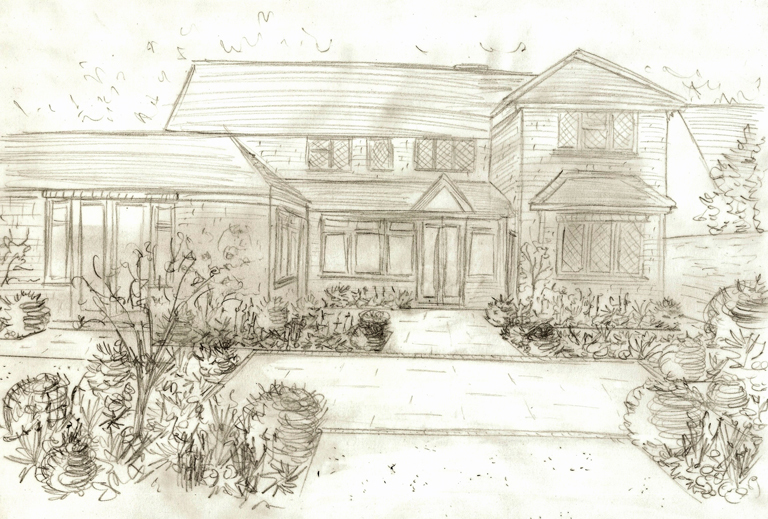 I have recently been commissioned to work with a couple in East Horsley. They’ve lived there for just over the year and now that they have completed some renovations to the house they are ready to tackle the garden. 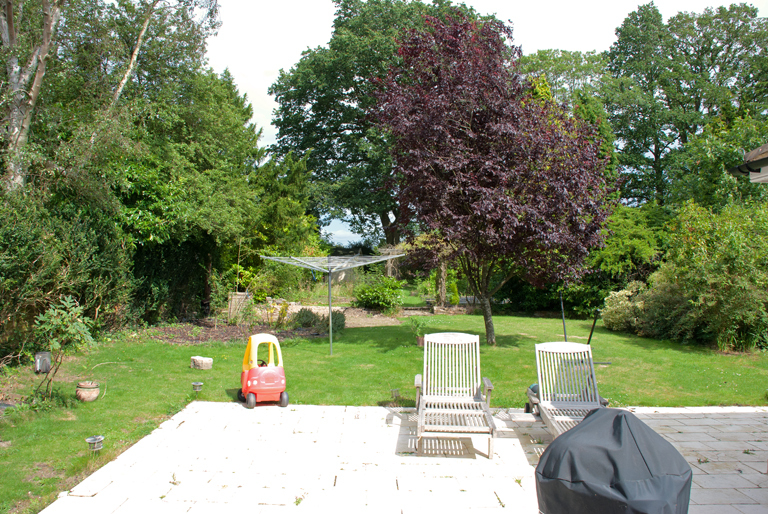 The house is in a fabulous location and they have access out on to the field beyond the end boundary. It’s so important that the garden not only fits with the house and their lifestyle but also works with the countryside beyond. The garden now is quite overgrown and a bit tired. When you look out from the kitchen it feels as though the garden stops at the archway. It’s not until you walk down the garden that you realise just how big it is. Beyond the shrubbery on the right, for example, there’s a greenhouse and area for growing veg. It’s huge, 42m long in total! My clients really wanted to open up the space and we all agreed from the outset that the beautiful oak tree at the end of the garden should be the main focal point from the house. The terrace needed to be big enough to accommodate up to 14 people so it has been moved out into the garden. This also created an opportunity to soften the walls of the house with planting. As you move away from the house the garden becomes more informal. The greenhouse remains where it is now but we have created a more attractive potager for growing vegetables. By the time you get to the oak tree at the end, the planting has turned to long grasses. I’m looking forward to moving the design to the next stage now ready for the construction phase of the project to start in the Autumn. I’ll keep you posted with the progress. WOW!! 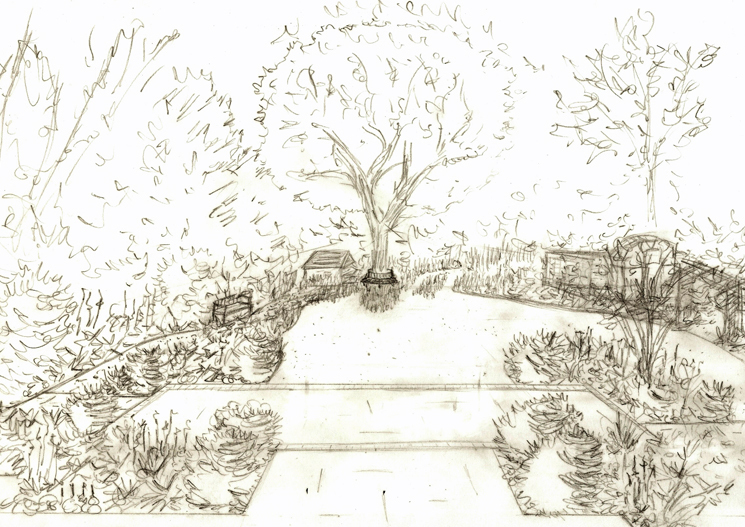 What an amazing project, can’t wait to see the finished garden! Thanks Louise – excited about this one too…something a bit different and brilliant location. Build should start in October so you shouldn’t have to wait too long to see the finished article! what a great project, cant wait to see the next phase! love the way it flows away from the house and ends in a summer house! a journey of discovery! Thanks Rosie – drawing up the design this week ready for the build to start in October…will certainly be blogging along the way!